Hot Pot 9-3/4", 10-3/4", & 12"
Hana Mishima/Flower inlay white and gray chrysanthemums with a smooth-glazed finish. A donabe pot is a Japanese casserole dish used to cook a variety of one pot dishes such as yosenabe, nabeyaki udon, sukiyaki, shabu shabu, and oden. It can be used directly on a flame to cook. 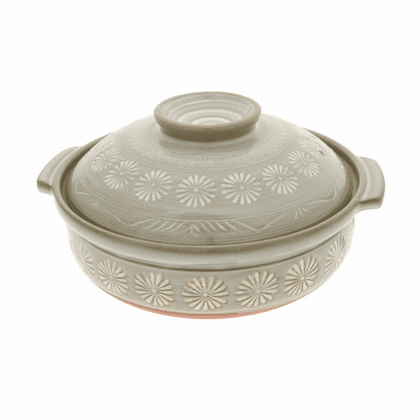 9-3/4" in diameter, 5-7/8" tall, #190916D ($79.95), 8 gou, for serving 3-4 people. 10-3/4" in diameter, 6" tall, #190917D ($90.95), 9 gou, for serving 4-5 people. 12" in diameter, 6-1/4" tall, #190918D ($135.95), 10 gou, for serving 5-6 people.